Which Of These Amusements Was Banned From New York City For Over Thirty Years? Which Of These Citrus Fruits Is An Ancestral Variety And Not A Modern Hybrid? Looking at them through the lens of the early 21st century, pinball machines seem downright wholesome—a throwback to an age before video games where kids could entertain themselves (with a soda included) for an afternoon with a handful of change. But how we view the antiquated pinball machine through the lens of the present certainly isn’t how it was viewed in the mid-20th century when the mayor of New York City and many of his supporters rallied against them. At the time, in the early 1940s, there was a panic over this seemingly benign form of entertainment. 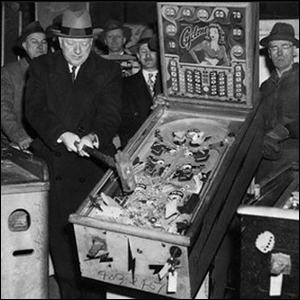 On the surface, Mayor LaGuardia made the argument that pinball machines encouraged gambling, were owned by the mob, and should be illegal. Beneath the surface legal justifications though, there was a strong moral element to the panic ranging from a focus on children wasting their time and money on frivolous activities to the idea that pinball machines were actually “tools from the devil” and designed to corrupt kids. In 1942, the mayor banned pinball machines in the city and many other cities across the U.S. followed along with the panic, enacting their own bans (including Los Angeles and Chicago). In New York City, there were dramatic Prohibition-style raids where thousands of pinball machines were captured in a matter of days, smashed with hammers, and thrown into the city’s rivers. The ban remained in effect in New York City for 34 years until the ban was overturned and pinball machines (with a proper arcade license for establishments with 10 or more) could return to the city.